Our local Girl Scout didn't come knocking this year, and we're a little mad and sad about that. Our wallet and body might be thankful, but our heart and taste buds are devastated. However, we are counting down the days until cookies go on sale again in our area (185 days). You can check when they'll be back in your area here! 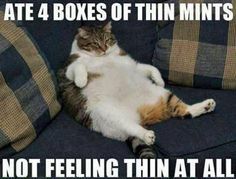 Until then, we found a copy cat version of our favorite: THIN MINTS! Now sit back and ENJOY the magic you just created. Tagged cookie, peaches and petals, thin mints.